Not a single day should go by without some kind of improvement being made somewhere in the company. Don't criticize, suggest an improvement. Think beyond common sense. Challenge assumptions. Even if something is working, try to find the ways to make it work even better. Ask searching questions. Customer-driven strategy for improvement – any management activity should eventually lead to increased customer satisfaction. Imagine the ideal customer experience and strive to provide it. Quality first, not profit first – an enterprise can prosper only if customers who purchase its products or services are satisfied. Recognize that any corporation has problems and establish a corporate culture where everyone can freely admit these problems and suggest improvement. Think of how to improve it instead of why it can't be improved. See problem solving as cross-functional collaborative and systemic approach. Emphasis on process – establish a way of thinking oriented at improving processes, and a management system that supports and acknowledges people's process-oriented efforts for improvement. Start with scarcity. 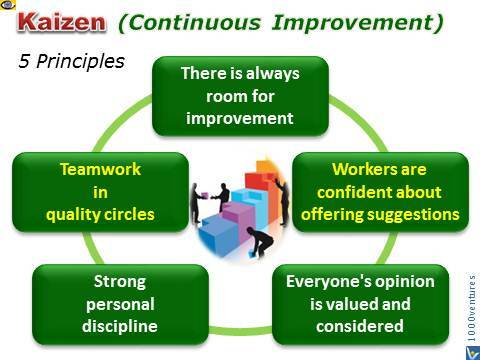 It's hard to see the need for Kaizen when resources are plentiful. When there is a worker or supplier performance problem, don't replace them. Keep them and help them improve instead.